Fall is pumpkin season! 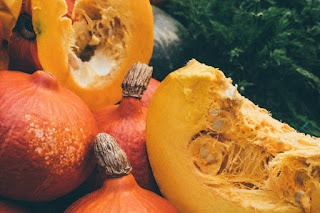 Whether you’re using fresh pumpkins as decorations, carving jack-o-lanterns, or roasting pumpkin seeds, here are two ways to use every part of the pumpkin to benefit your skin! Once you’ve removed the seeds and pulp, wash the pumpkin and cut into medium-sized cubes. Place the cubes in a medium saucepan, cover with water and bring to a boil. When the cubes are tender, drain and cool. Combine with the, yogurt, honey and cinnamon in a blender and puree. Lather the mixture onto your face, leave 10 to 15 minutes and remove with a warm washcloth. Your skin will positively glow! Blend oil and seeds in a high-speed blender, then apply to your face and gently massage into your skin. Remove with a warm washcloth.